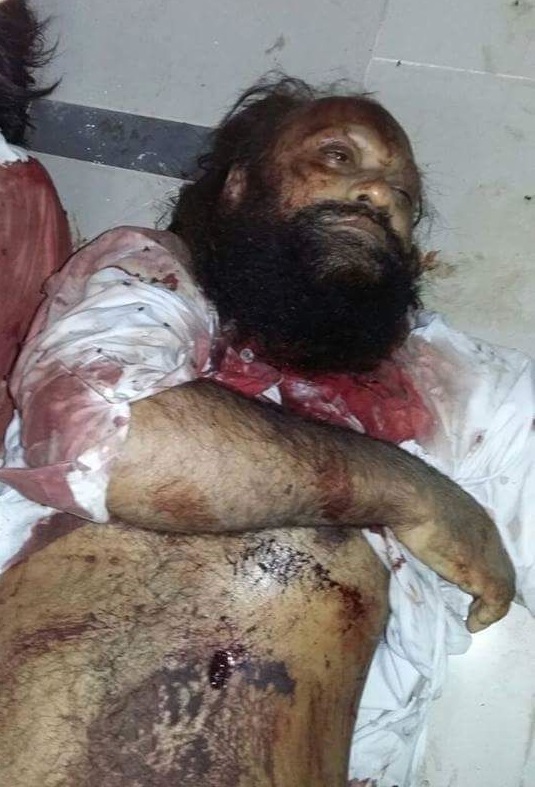 JNN 29 July 2015 LAHORE : Malik Ishaq, chief of banned Sectarian Terrorist outfit Lashkar-i-Jhangvi, his two sons Usman and Haq Nawaz, and 11 attackers were killed in an alleged exchange of fire with police personnel late on Tuesday night. At least six policemen were injured in the alleged encounter. Ishaq, his two sons and other alleged members of LeJ were taken into custody by the Counter Terrorism Department several days ago in connection with eight recent sectarian killings. Following their recent arrest, the police had interrogated them and had subsequently taken them to Shahwala in Punjab’s Muzaffargarh district to aid the police in recovering weapons and explosives, sources in the CTD said. The encounter appears to have taken place as Terrorists attacked security forces and tried to free Ishaq who was killed in the ensuing exchange of fire, security sources say. A spokesman for CTD Multan said Ishaq, his two sons, one Ghulam Rasool Shah and two other accused, all from Lashkar-i-Jhangvi, were taken to Muzaffargarh by the counter-terrorism department to aid in the recovery of arms and explosives. The spokesman said that when the police party was returning after making the recovery, it was attacked by some 12 to 15 gunmen who succeeded in freeing Ishaq, his sons and the other accused and fleeing away on motorcycles. “Twelve to 15 terrorists attacked the police party… freed the accused and fled away on motorcycles,” a police spokesperson, Nabila Ghazanfar, quoted a policemen in the area as saying in a message. The militants were met with by SHO CTD police station who had quickly been informed about the attack on the police party and was travelling on the route that the terrorists had taken, the spokesman said, adding that that’s how the encounter ensued. The SHO challenged the terrorists , resulting in the encounter in which six police personnel sustained injuries, the spokesman said. They were shifted to the district headquarters hospital. The spokesman added that 14 terrorists, including Malik Ishaq and Ghulam Rasool Shah, were killed by the attackers themselves. A large amount of weapons and ammunition was recovered from the attacking men and an investigation has been initiated into the events. Ishaq’s postmortem was underway at District Headquarters Hospital, Muzaffargarh at the time of filing of this report . The bodies of the dead and the injured officials were shifted to the District Headquarters (DHQ) Hospital in Muzaffargarh. All gates of the hospital were sealed soon after. Lashkar-i-Jhangvi is regarded as the most extreme Wahabi terror group in Pakistan and is accused of killing hundreds of Shias after its emergence in the early 1990s. The organisation is also said to have links with Al Qaeda. “Ten of the 14 terrorists killed in the encounter belonged to al Qaeda,” a CTD spokesperson told JNN. Further, he said they are seeking NADRA’s help in identifying the deceased. Lashkar-e-Jhangvi (LeJ) has been behind some of the most violent attacks & Target Killing of Shia Muslims in recent years. Born in 1959 in Punjab’s Rahim Yar Khan district, Malik Ishaq was one of the founding members of the banned sectarian outfit Sipah-e-Sahaba Pakistan ,Presently working Under the title of Ahle Sunnat Wal Jammat ( ASWJ ) , but following differences with other SSP leaders he formed the Lashkar-e-Jhangvi ( LeJ ) . The organisation was banned more than a decade ago by former president Pervez Musharraf. Ishaq, who is a leader of the feared organisation, was wanted in dozens of cases, mostly murder. Ishaq was on a US list of global terrorists and the group he founded has claimed responsibility for the deaths of hundreds of civilians. He has faced several murder trials but always been acquitted after witnesses refused to testify against him due to the terror and fear of his Group. Ishaq was in police custody for more than 13 years on over 70 charges of sectarian killings. He walked free in December 2014 after a decision by Lahore High Court. He was arrested in 1997 and who was wanted in dozens of cases. He was released on bail in July 2011 after serving a jail term of nearly 14 years. Since his 2011 release he has been frequently put under house arrest as his sermons raised sectarian tensions. He was also arrested in 2013 over deadly sectarian attacks targeting the Hazara Shia community in Quetta. The first attack took place on Jan 10, 2013 targeting a Hazara snooker hall and killing 92 people and the second bomb attack occurred on Feb 16, killing 89 people. The attacks were claimed by Lashkar-i-Jhangvi. Ishaq was also accused of masterminding, from behind bars, the 2009 attack on the Sri Lankan cricket team in Lahore, which wounded seven players and an assistant coach, and killed eight Pakistanis. The attacks saw Pakistan stripped of its right to co-host the 2011 cricket World Cup and jeopardized the future of international cricket in the country. The General view of the Pakistani Nation on the Killing of Such Notorious Terrorists and their Hench Men is very Jubiliant and they are Praising the Pakistani Army and the LEA on taking , such steps for the elemination of terrorism from our Beloved Nations . As per our Survey Conducted in Different cities of Pakistan , the General Pakistani Public was very Happy , and was of the view that due to the Brave and Bold Decisions of Chief of Army , General Raheel Shariff , and his Long sighted Vision the Nation is feeling secure after decades , and the successes in the successful ” Operation Zarb e Azb ” which is still moving towards its final Goal , of Making Pakistan a Peaceful and Anti Terrorist state , whether Sectarain , extremist or Economical terrorism , will definitely lead the Pakistani Nation to the Top of the List among Developed , Socialized , Peaceful and Industrialized Nation. It is due to His Bold Decisions and Courageous steps that Now the Overseas Pakistani are Once again have started to come Back to enjoy the Luxuries and Beauties of their Motherland. This entry was posted in Asia Pacific, Current Affairs, Pakistan News and tagged Al-Qaeda, ishaq, Lashkar-e-Jhangvi, LeJ, Malik Ishaq, Sipah-e-Sahaba Pakistan, SSP, Terrorists. Bookmark the permalink.